Typically when one thinks of body art they think of tattoos and piercings when in actuality body art can be the modification of any body part. One particularly unique place that people are having modified is their teeth. People can now get certain modifications done to their teeth as well as the rest of their body. People are not able to have their teeth filed so that they are a desired shape or size and they can have them implanted with jewels. Tooth filing is not always a procedure that is done out of cosmetic desire. In some cultures, such as in Bali, people get their teeth filed flat as part of a religious ceremony which is done “to control evil human characteristics (sad ripu): greed, lust, anger, confusion, stupidity, jealousy, ill-will, and intoxication by either passion or drunkenness” (Religion Tooth Filing). Tooth filing for the Balinese people is a rite of passage that is done usually when a person first reaches puberty and if not then than it must be performed either before or as an integrated part of the wedding ceremony. The implanting of jewels in teeth is a rather new procedure but has become rather popular among celebrities. 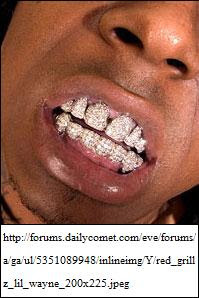 Stars such as Pink and Lil’ Wayne sport the tooth piercings. Though both have tooth piercings, Lil’ Wayne takes it to a new level. Lil’ Wayne went beyond the usually semi permanent jewel implants and he surgically $15,000 worth of jewels implanted on his teeth. This permanent bedazzling of his teeth can only be removed or changed if he goes to the hospital and has them perform surgery on him. "Religion Tooth Filing." Bali Tooth Filing. 30 Apr. 2009 .